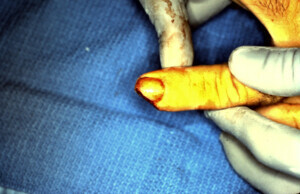 Reapir of Index Finger Amputation with Full Thickness Skn Graft. Full thickness skin grafts are capable of providing skin that will allow a wound to heal faster than allowing it to heal by secondary intention (by itself). Grafts require a healthy well vascularized wound bed for them to take so are not suitable to cover bone and tendon. Skin grafts will expedite wound closure but sensory recovery is not as good as allowing a wound to heal by secondary intention. There is a trade off, earlier wound closure for reduced sensation. Additionally, skin grafts will not provide as much padding and protection as a cross finger flap would. Amputation of radial aspect index finger. 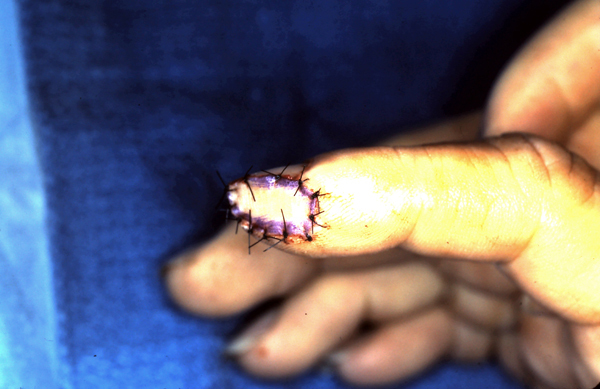 Immediate intra-operative view of graft sutured in place. Approximately 5 days post operatively, viable graft in place. The graft will mature over time and re-contour and toughen to an almost imperceptible appearance although sensation will not be as good as healing by secondary intention or a cross finger flap. Healing by secondary intention would take much longer than any other surgical alternative.